I’d like to keep these sparkling white toilet seating looking fresh & new for longer than 5-1/2 years this time! I’ve found a few interesting things (and one really cool thing! )… but others’ opinions on this topic would also be welcomed. 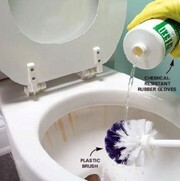 Which products to use for cleaning toilets. Personally, I don’t feel like most of us need too much instruction on how to clean a toilet. Still, there’s plenty of info about how to do it on the Internet — much more than there is on how to buy a toilet seat (…which amazes me). Okay, here’s where it gets good. The biggest reason we had to ditch our old toilet seats after only 5-1/2 years was the fact that they were stained blue from all the cleaners we’ve used on them through the years. And there were actually parts of the seats that were worn down to the bare (brown) wood; they were white when we bought them. The worst offender: those darned BLUE cleaners! Up til now, we hadn’t really found “the best” toilet cleaner, so just bought whatever was on sale. Sometimes, you hope it’s not another blue one — yet you never really know until you get it home and open the bottle. Fast-forward through all the products we’ve tried in the past to now. We have finally found one we love! It’s hard to find. I’ve only seen it on QVC. It’s Don Aslett’s Safety Foam Toilet Cleaner. It happens to be a light green in color — yet it’s non-staining. I first watched it demo’d on QVC for over a year before I actually bought it. Then, when we got all new toilet seats, I finally decided it was time to splurge and get a product that’s got a good track record. I like it because it smells great. And it only takes a little bit… it’s highly concentrated. I couldn’t be happier with this product. That, and that fact that it comes in a complete little “set” (the cleaner, a bowl swab/brush, a pumice stone, and a swab/brush holder) makes Don Aslett’s the perfect toilet cleaning product around. In case you’re wondering, yes you can find just the bowl swab elsewhere online. It’s really inexpensive too. But I’ve been wanting to try Don Aslett’s complete set for so long that now seemed like the perfect time to just order a complete set. Plus, while Aslett’s bowl swab (they call it a Johnny Mop) appears to be made better (and bigger) than most of the other toilet swabs found online, if I ever wanted to buy some replacement (non-Don Aslett) swabs later, I certainly could. And now I have a way to store it all together — thanks to Aslett’s handy toilet cleaning caddy! I’m not the only one who thinks the bowl swab is the best invention ever! The biggest difference between a using a bowl swab and a regular toilet brush is the fact that you pour the cleaning product directly onto the swab (like in the picture above), rather than inside the bowl. The swab is made to easily get the cleaner into all the right places — without dripping, scrubbing, or staining. For even more toilet cleaning tips, be sure to check out the Don Aslett demo video at the QVC link above. UPDATE: I’ve been using the Don Aslett toilet cleaning set — and bowl swab — to clean all 3 toilets in our home for the past 8 years now. Each bottle of the cleaner lasts forever! On a related note, we gave up the traditional toilet bowl brush years ago. A friend of ours used to work for a commercial cleaning products distributor. She sent us a few of her favorite products to try out. One was this revolutionary (at the time) “toilet bowl swab.” She gave us 3 — one for each bathroom. And I am so thankful she did. We love these things! The only downside: there was no way to wring out the excess water from the swab alone. So I made my own. Back when I first saw the Don Aslett toilet cleaning products being demonstrated on QVC, I realized that I could take a simple (thick & pliable) plastic cup… cut a small hole in the bottom (just enough to fit the wand through)… and then squeeze the cup itself (with the swab inside) to wring out the water! Worked like a charm. They’ve lasted a long time too. The best part is bowl swabs don’t get nearly as gunky and stained and icky looking as traditional toilet brushes do. I’ll never go back to using a regular toilet brush. Regarding the care and cleaning of toilet seats, Kohler says “avoid using aerosol products.” I’m not exactly sure what that’s all about — they’re harsher I guess. Kohler also says, “painted wood seats require special care and cleaning. Use only mild detergent (such as dishwashing soap).” I would agree with this. In fact, I’m thinking regular dish soap would probably work just as well as anything else on the planet — except for the Aslett toilet cleaner. 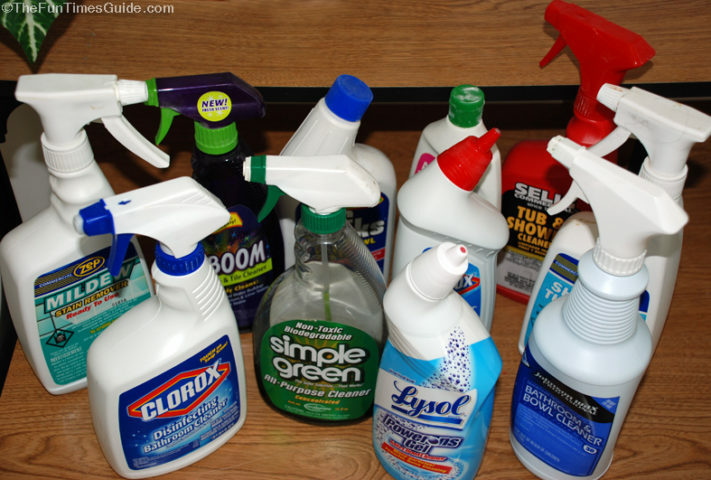 And finally… has anyone ever tried using vinegar to clean toilets? Who knew there was a Toilet Seat Art Museum? News Flash: Toilet seats aren’t that dirty! A toilet so clean you could eat cake. Bathroom secrets: Do you snoop in others’ medicine cabinets? Check out this annual contest: toilet paper wedding dresses. Fun facts about bathroom behavior… who knew?! A new invention: the incredible LED-lit toilet seat. Here’s proof that toilet paper direction does matter — over vs under.